Now this is interesting. A survey at the New York Times shows a significant difference of opinion between the average person in the pew and the Catholic church hierarchy. 66% favour allowing priests to marry. 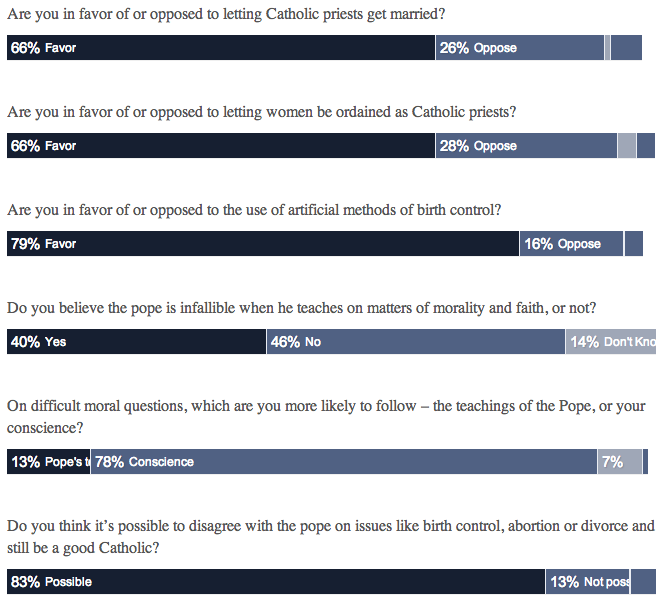 79% favour the use of birth control, and my understanding is that a higher percentage of Catholics than that will actually use birth control at some point. I’d be very interested in seeing what these figures look like on a global basis, whether this is a uniquely North American phenomenon, or whether there is genuinely a huge rift between the official teaching of the hierarchy and the Sensus Fidelium, the understanding of the faithful, of the church as a whole. This raises questions for those outside the Catholic church, too. What happens when the official key holders of doctrine state one thing but the general population holds a different position? What happens when a long-held claim to divine authority encounters a groundswell sense that the hierarchy is actually in the wrong? Posted in Religion on March 9, 2013 by trevor.